*This car is for sale as a Classic Showcase restoration, either to a Show-Driver or Show level restoration. Please see our restoration page for further information. 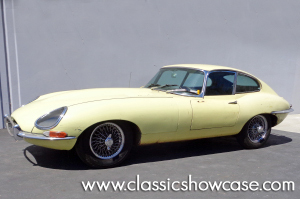 This is an original and highly collectible, matching-numbers 1967 XKE Coupe. This is a great candidate for an original or modified restoration of your choosing. Included in the restoration process, the vehicle will be stripped to bare metal, placed on a rotisserie, metal finished, leaded, all body parts fitted to the car and chrome, prepared for primer, sealer, paint, base, clear, color sanded and buffed to a fabulous finish. All systems will be gone through and the engine will be rebuilt back to factory specifications. The fuel, electrical, cooling, and hydraulic systems will be restored. All components will be rebuilt back to factory specifications, including the engine, transmission, rear end and suspension. All chrome will be re-plated as needed. The car will receive a complete new custom tailored and fit interior in the correct materials by our upholstery department. A DVD of the restoration process will accompany the vehicle. Upon completion of the restoration this Jaguar will be a great example to drive, enjoy and compete in shows. Launched in 1961 at the international motor show in Geneva, the XKE echoed the sensation of the XK-120, perhaps even more. An astonishing performance package, with amazing speed and handling, the XKE’s’ brand-new 4-wheel independent suspension system was so well conceived, it was used by Jaguar for over thirty years. The Series 1 4.2 is a very user friendly, sporty driver, with all-synchro 4-speed gearbox introduced by Jaguar in 1965, and is one of the most collectable of the E-Types. Some of the features of this model are covered headlights, toggle switches, full instrumentation with styling and a design that was way ahead of its time with center console, and arm rests. Other features of this Series 1 are its steep windshield and tail lights, which are placed above the bumper line in the rear deck. Similarly, the parking lights are above the front bumper line in the front fenders. In 1964 when the 4.2 was tested, fuel consumption was rated road reported at 22 MPG, and a top speed of 140 MPH.